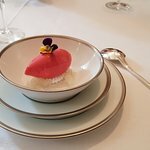 It was my dream to eat at a 3 star Michelin restaurant, and my husband made that dream come true for my 50th birthday. 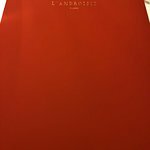 I chose L’Ambroisie, and it lived up to my expectations. 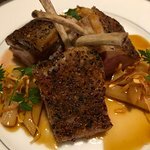 From the warm unintimidating welcome, to the beautiful comfortable dining room, to meeting the legendary Bernard Pacaud himself, and enjoying every course we had; it all lives up to my dreams. 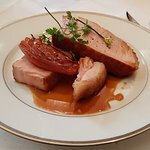 I expected the food to be sublime; and it was; but the excellent service and perfect pace of the meal and politeness of the staff all contributed to what was a lovely experience. 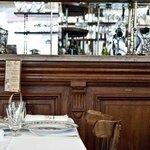 This place is truly one of the few genuine benchmarks of French food preparation. There’s no fancy food tricks and playful humour here, just experienced expertise applied to the best quality ingredients. It’s worth sacrificing multiple mediocre meals for one superlative meal here, that’s what I do and it took me years to realise this logic. 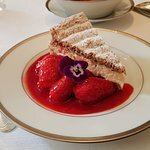 Once upon a time, there were two Paris restaurants so traditional, so formal, so austere that they would have made a Theresa May cabinet meeting seem jovial. They were Le Taillevent and L’ Ambroisie. No English menu. No English language. L’Ambroisie was rumoured to seat foreigners in a separate room. One such guest asked if the waiter would take a photo of her: “Non”, resonated the reply. 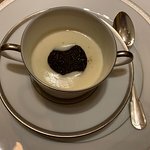 Le Taillevent despaired of its one Michelin star and its sometime empty tables - and went the way of modernity : see our separate review. 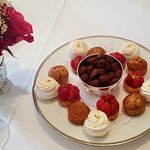 And L’Ambroisie ? Well the wine waiter did crack a half smile when we ordered some very expensive wine. And the young dessert waiter did make a joke .... he won’t last long. The food? We have to start backwards. The assortment of desserts was to die for. No “mini” samples here, Five huge plates and five huge offerings. A wonderful chocolate cake with coconut ice cream. A whisky cream. Lemon posset. Hot madeleines - the best in Paris. Our sugar rush caused us to black out the rest. 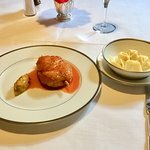 The poulet de bresse for two ? 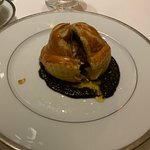 Contrast this with our review of chicken at Le Taillevent. Two wonderful servings. The second service more memorable than the first : two hot crispy thighs on a deliciously dressed salad. 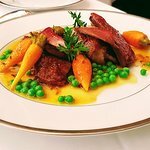 RIP Paul Bocuse and move over Le Bristol. And a starter I didn’t much care for, but which the other tennislover enjoyed: langoustines in a curry sauce with black truffle. Would we go back? Do they open for breakfast ? 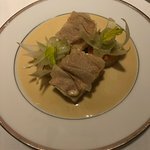 I did my thorough research to find the perfect two 3 Michelin Star Restaurants in Paris while visiting for four nights. I picked “Le Pre Catelan” (amazing - see my review) and this restaurant. 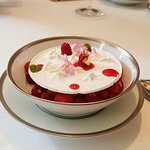 Dined at Alain Ducasse two years ago (see my review). Unfortunately, my expectations were amiss. The prices are typical 3 Michelin Star restaurants so no complaints. In terms of food, the entrees were very disappointing especially my very own. 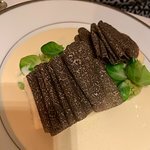 I opted for the sea bass with black truffles and golden caviar as my entree. We all ordered 3 dishes for each of us plus desserts. The fish tasted like it was days old and had fishy smell. It was yucky!!! I didn’t bother telling our cocky waiter, not worth my time and breath! 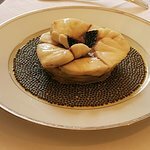 I’ve never been to a fine-dining restaurant where fish smelled, let alone at a 3 Michelin Star restaurant, of all places in Paris! Unbelievable! 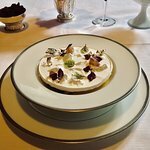 And this restaurant is the longest running 3 Michelin Star since 1988 - yes I did my research! We are fine-dining enthusiasts and been to quite a lot. 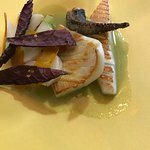 I only ate a small piece of my sea bass and it costs either 240 Euro or 142. It’s in French so can’t tell, but I will post the menu so u can see. 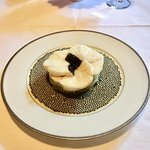 I ate all the caviar of course and the black truffles leaving just the sea almost untouched. My dinner alone costs 425 Euro (3 dishes and dessert) not including my husband’s and daughter’s. 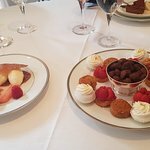 The dessert cost 35 Euro each which is outrageous! Not to mention, nothing special! We each ordered desserts despite of its outrageous price! 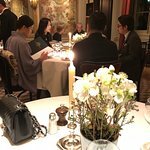 I can’t believe this restaurant was voted the best 3 Michelin Star and the most romantic in Paris. I beg to differ! For the price, go elsewhere bec there is nothing that this restaurant can impress you unless you’re NOT an avid Michelin Star enthusiast. The menu is in French. At first our waiter was so surprised that we don’t read in French! Damn cocky waiter like everyone speaks French! You may have the most beautiful language, but most people don’t speak your language!!! Not only that, your restaurant serves mediocre food and bad service! It took for them an hour to come back to translate in English. Hubby went on Google translate to find out what the menu was. 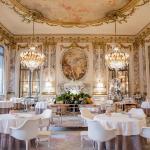 There are ten 3 Michelin Star restaurants in Paris and definitely skip this! 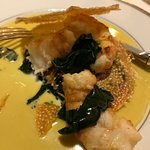 Do not miss “Le Pre Catelan” which was AMAZING and service was wonderful! We spent more money there, but it was worth it! 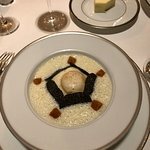 If you can only go to one 3 Michelin Star restaurant, spend your money there not here where waiters are cocky and food is nothing impressive! 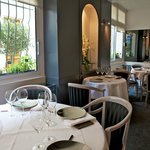 We have really enjoyed our experience at L’Ambroisie. 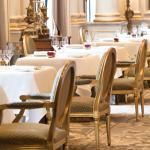 The decor is very romantic 18th century French style with parquet flooring, authentic furniture and various tapestries. The menus are only in French but the service gladly explains the menus. The food was excellent. 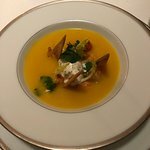 My favorite dish was the seafood course with curry. 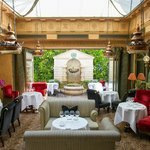 Really nice place and is probably my favorite along with Guy Savoy. 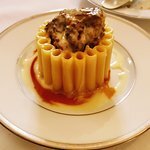 Been to L'Ambroisie? Share your experiences!